The new set, Boundaries Crossed adds a new stadium card into the mix with Aspertia City Gym. This is an awesome addition to the card pool because as of right now, the format is really lacking in playable Stadium Cards. Skyarrow Bridge is the only Stadium Card that really sees a lot of play, and Tropical Beach saw some play before rotation, but it hasn’t found a good place in competitive play since the rotation. Twist Mountain and Pokemon Center have never gained any footholds in competitive play as they are either too weak (Pokemon Center), or working with a silly game mechanic that doesn’t quite work (Twist Mountain). Our newest Stadium card seems to have quite a bit of potential playability. Aspertia City Gym adds +20 HP to any Colorless Pokemon as long as it is in play. I think Aspertia City Gym gives Colorless Pokemon a lot more playability. Just using the Stadium itself, you are adding +20 HP to these Pokemon, and when paired with Eviolite or Giant Cape, you are effectively adding +20 more HP to these Pokemon, for a grand total of +40 HP to these Pokemon, which can be very strong. One important thing to remember when using this Stadium as part of your strategy is that Stadiums can be countered by other Stadium cards. Your Colorless Pokemon might be sitting alive and pretty at one moment thanks to Aspertia City Gym, but a moment later that same Pokemon could be knocked out at the drop of a Skyarrow Bridge. In the rest of this post, I want to take a look at some of the Colorless Pokemon and what this new Stadium means to them. Colorless Pokemon have generally been some of my favorites. Persian, Eevee, Cleffa, Zigzagoon/Linoone, Smeargle, Bouffalant, Munchlax, and Minccino/Cinccino are some of my favorites, just to name a few. The first Pokemon on our list is one of my personal favorites, and that is Cinccino. Cinccino previously saw play in a variety of Stage 1 rush decks at the beginning of the HGSS-on format. The main attack players used with this Pokemon was Do the Wave, which costs CC and does 20 damage times the number of benched Pokemon you have for a maximum of 100 damage. As is, Cinccino has 90 HP, but with Aspertia City Gym that goes up to 110 HP and with Giant Cape that goes up to a massive 130 HP. Going up to 110 HP will allow Cinccino to survive a Night Spear, a Volt Bolt, and it would force Mewtwo EX to go up to 3-4 Energy to ohko Cinccino, depending on whether your opponent plays PlusPower or not. If you’re forcing your opponent to play more than two Energy onto their Mewtwo EX to knock out a non-EX Pokemon, you can safely engage in a Mewtwo war to your advantage. Does Cinccino stand up in the current format? Maybe. Outrage dragons like Zekrom and Reshiram are no longer as big of a deal as they once were when Cinccino was popular, so for the most part, Cinccino should be safe to hit into anything with o repercussions. Being able to potentially 2hko any EX in the game with Do the Wave has the potential to be very strong, especially when they cannot get the return ohko on you. It wasn’t too long ago that Tornadus EPO was seeing play in one of the strongest decks in the format, Troll. The idea behind Troll was to get Tornadus EPO going on turn 2 of a game, and then take a prize nearly every turn by using Pokemon Catcher to prey on low HP Pokemon, and then use other energy efficient attacks such as Terrakion’s Retaliate to continue the knock out train, countering the other top Pokemon in the format. Will Aspertia City Gym make Tornadus powerful enough to create a new age Troll aimed at countering the meta that will develop during Cities? As is, Tornadus has 110 HP, which is fairly solid. With Aspertia City Gym, Tornadus goes up to 130 HP, and with an Eviolite attached, Tornadus has an effective 150 HP, making it something that won’t be easy to knock out, and would theoretically make it a very strong starter Pokemon for a deck. 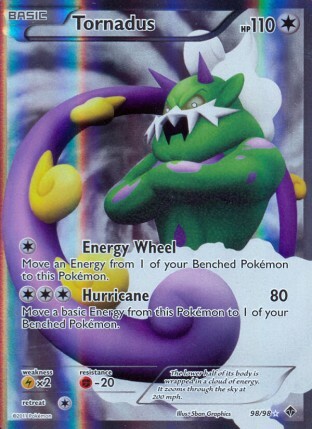 Tornadus’ main attack is Hurricane, which does 80 damage and moves a Basic Energy card to one of your benched Pokemon. This attack is really good on turn 2 in a format full of low HP starter Pokemon, which this format is in many cases. Deino, Sableye, Tynamo, and Squirtle are all going to be there for some easy prizes. Tornadus is also a really good starter Pokemon for a deck as it won’t be donked and it resists two of the most powerful donk Pokemon in the format – Landorus EX and Stunfisk. 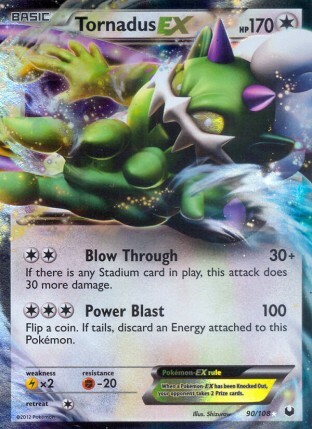 With the HP boost, I can definitely see Tornadus finding it’s way back into the meta game in a new age Troll deck. This is one of the deck types I am most excited to get working on in the new format. Perhaps the greatest beneficiary of this gym are going to be our Colorless EX Pokemon, which in the case of Regigigas EX, goes up to 200 HP with the Stadium in play, and an effective 220 HP with Eviolite, which is a ton. In the past, Regigigas EX has seen very little play. It’s only real impact on competitive play was in CMT decks as a soft counter to Zekrom/Eelektrik, Durant, and Typhlosion/Reshiram decks. What made the card so powerful against these decks is that it is a card that your opponent either needs to ohko or play around. If they slam into it with a Blue Flare or Bolt Strike, all of their EX Pokemon will suddenly be in danger of getting knocked out by Regigigas’ Raging Hammer attack which does 50 damage plus 10 more damage for each damage counter on Regigigas. Regigigas as a whole has two very strong attacks. Giga Power costs CCC, and does 60 damage plus 20 more damage, but if you do the 20 more damage, Regigigas does 20 damage to itself. 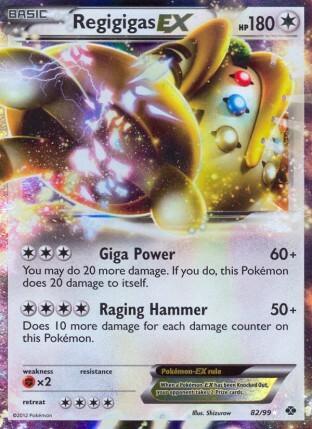 This is okay though, as that damage can be negated by Eviolite or even used to your advantage to power up stronger Raging Hammer attacks, which costs CCCC. I think Regigigas EX is going to be a very big factor in the upcoming meta game as it is one of the strongest counters to Blastoise/Keldeo decks that we have in the format. It can start knocking out Squirtle on turn 2 with Giga Power, and if Keldeo EX swings into it for any significant damage, then you can just ohko Keldeo EX back. If they load up Keldeo EX too much in an attempt to ohko Regigigas EX, then you can just setup a Mewtwo EX and X-ball it for two easy prizes. 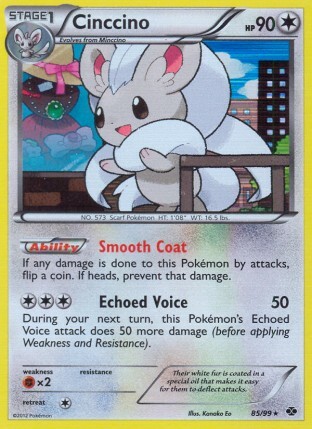 Cinccino from Next Destinies has been one of my favorite cards ever since it came out. 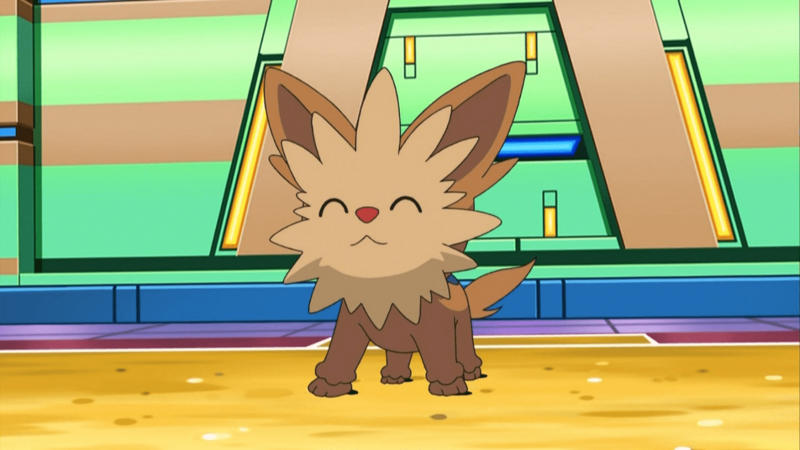 I played it a bunch in a very fun Cinccino/Hypno/Vileplume deck last Spring and have already re-built that deck as Cinccino/Munna/Audino for the current format, which is a very fun deck that is actually able to beat a lot of things. I have a fairly good record with the deck already playing against what are supposed to be competitive decks. If you don’t know about the deck already, check out my article on the deck, it will be one of the most fun decks you ever play. Cinccino, despite being a little guy, is one of the tankiest Pokemon in the game. Standing in at only 90 HP, it is able to absorb big hits from your opponent’s Pokemon and stay standing thanks to its Smooth Coat Ability, which allows you to flip a coin everytime your opponent attacks Cinccino for damage and if Heads, you prevent all damage from that attack. Aspertia City Gym really helps the tankability of Cinccino, as even when your opponent breaks through to do damage against Cinccino, cards like Darkrai EX or Raikou EX don’t have strong enough attacks to ohko Cinccino. Between your opponent not being able to ohko Cinccino and its Smooth Coat Ability, a single Cinccino can stay alive for a very long time! This is a big deal, because its attack is greatly boosted by staying alive. Echoed Voice costs CCC and does 50 damage, and then 100 damage on each consecutive turn that it is used. 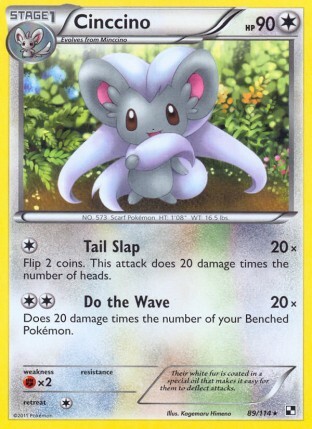 If you get a Cinccino staying alive swinging for 100 turn after turn it really does a good job of running through your opponent’s deck, especially given that Cinccino is a non-EX Pokemon, so they only get one prize everytime they knock out a Cinccino, forcing them to take all of their prizes the hard way. Tornadus EX has been popular in competitive play ever since it saw release in Dark Explorers last May. It was primarily featured in a Darkrai/Tornadus deck that did very well during Battle Roads, and has recently saw more and more play with Fighting type Pokemon in anti-meta counter decks too. This is the one card that benefits the most from having a Stadium Card in play, as its Blow Through attack does 30 damage, plus 30 more damage if there is a Stadium card in play for CC. This is probably the best donk attack in the game right now, so any deck that is able to take advantage of Blow Through effectively can be a very powerful deck. Its second attack, Power Blast, does 100 damage for CCC, and you have to flip a coin, if tails discard an Energy attached to Tornadus EX. Its second attack is strong enough to 2hko any EX in the game, and often times you can get the 2hko through a combination of its first attack with its second attack with PlusPowers. With Aspertia City Gym in play, Tornadus EX goes up to 190 HP, and an effective 210 HP with an Eviolite attached. Tornadus EX should find a comfortable place in the meta game this Winter as Landorus EX will be the basis of some of the strongest decks in the game during City Championships, and Tornadus EX has a resistance to Fighting. Can you say Bouffalant EX? That’s pretty much what Bouffalant turns into if you take advantage of all of the tools available to you with this card. At its base, Bouffalant has 100 HP. However, it has an Ability, Bouffer, which acts as a built in Eviolite, reducing attack damage by 20, which gives it an effective HP of 120 HP already. Add Aspertia City Gym to the mix, and it has an effective 140 HP. Slap an Eviolite on it as well, and it turns into a monster Pokemon that has an effective 160 HP. This wasn’t the easiest card to knock out for some EX decks as is, so adding a new way to tank it in addition to Eviolite makes the card much much stronger. For those that need a refresher on what Bouffalant does, it is one of the strongest EX-hate cards in the game. 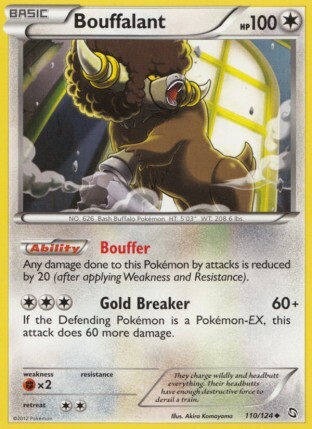 Its attack Gold Breaker costs CCC and does 60 damage, plus 60 more damage if the Defending Pokemon is an EX. This attack means it will 2hko every EX in the game, while at the same time being very difficult to be knocked out by EX Pokemon, especially when it is taking advantage of all its support cards. Aspertia City Gym is the Normal type Gym in the games and anime, first ran by Lenora and then Cheren in BLW2. I think that’s probably all of the Colorless Pokemon that there are to know about using with Aspertia City Gym. You could use it with Stoutland and Giant Cape to put that card up to 180 HP, but that does nothing to solve its ohko problem from Terrakion EX or Landorus EX, and most other things are still going to 2hko it either way. It could be used with Ditto to keep Ditto alive better in the early game, but once you Transform to a new Pokemon with Ditto, all that damage is still going to be there, and if there is damage greater than the Transformed Pokemon’s HP, that new Pokemon is just going to be knocked out, unless it is Colorless itself. I really like Aspertia City Gym and the new playability that it gives to Colorless type Pokemon in the game. The little bit of HP boost that the Stadium provides should be enough to give some otherwise unplayable Colroless Pokemon a new chance to shine in competitive play. The best part about this card is that it is well balanced, as it can simply be countered by your opponent playing down another Stadium Card. Stadium wars aren’t really something that we have in the game as of late as Skyarrow Bridge was the only Stadium card seeing mass play, but now that we have two strong Stadium cards in the game, as well as two more strong ones on the way (Virbank City Gym and Plasma Frigate), we might see the return of Stadium wars, which will be a fun new aspect of the game. So what does everyone else think, are Colorless Pokemon going to make a bit of a comeback this format? Really good read! I am intrigued by this stadium as well..although I was more excited for Virbank. Alas.. 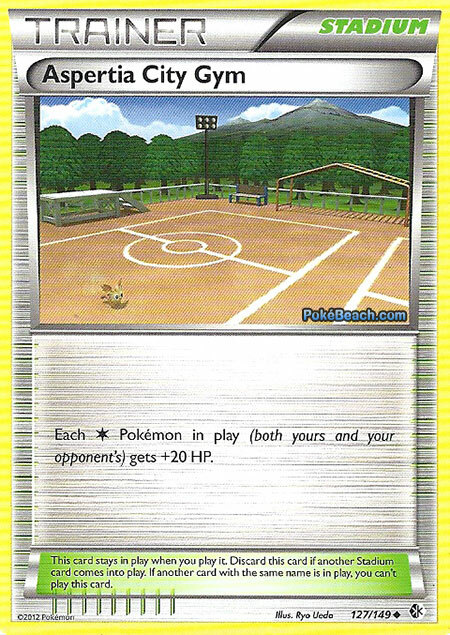 Anyway, something I think you should have pointed out is that with Aspertia City Gym in play you obviously can’t have Skyarrow..which MAY be the better stadium for several of the the Pokemon you listed (Tornadus EX and Tornadus mainly). What are your thoughts on that? I always forget that Bouffalant is in the format. He has definitely improved with the release of ACG.